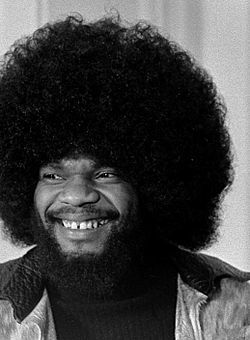 Billy Preston (September 2, 1946 - June 5, 2006) was an American R&B musician. He is best known for his piano and organ playing. Preston began playing piano when he was three years old. He worked with many other musicians including Aretha Franklin, Sammy Davis Jr., Quincy Jones, Eric Clapton, the Jackson 5 and the Rolling Stones. He worked on The Beatles's last album, Let It Be, in 1969, including the song "Get Back". Many people thought that Preston would join the group, but the Beatles broke up shortly afterwards. He later worked with George Harrison, who had been a Beatle. Preston's biggest success also came from working with another musician. He did a duet with Syreeta Garrett on "With You I'm Born Again" in 1979. It sold over a million copies and reached Number 2 in the United Kingdom singles chart. Preston was gay. He died of respiratory failure after being in a coma from pericarditis (an infection of the heart). Billy Preston Facts for Kids. Kiddle Encyclopedia.